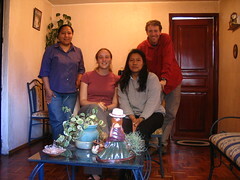 This past Saturday, one of my students, Olga, invited us to her apartment. It’s way the heck in the south of Quito. Took us about an hour to get there. In the picture above, Olga is the one on the left. Her sister Marta was also there. Olga enjoys cooking; she made us a shrimp ceviche (ceviche is the cold soup that is really popular in Ecuador, especially on the coast — it often has seafood), some fried fish, fried shrimp, rice, orange juice, and aji. We started with the ceviche, and when Olga brought out the main course, Eileen’s first thought was that it was for all of us. But then she brought out two more plates. After lunch, we walked in the backyard a bit. It had grass! And it bordered on a ravine with a river running through it. We then walked to a nearby park. It’s as far south in Quito as we’ve been and it was almost like a different city. Much more residential, not a lot of tall buildings, hardly any gringos at all. Olga is in my night class and she’s the only one who arrives on time every day. She’s very dedicated even though sh’e told me that there’s no pressing reason for her to learn English. Her sister is a high school English teacher, so she can practice with her every once in a while. I haven’t had Olga in class all year. She began with Westra, but then when we made the Great Switch back in February, I gained Olga as one of my students. On Saturday, she was telling us about how when she was in college, she had to take a year of English. Well, one day she got there and they were taking a test. She arrived late and had missed the directions. She worked on it for a while and finished, but then found an “answer sheet” which she hadn’t been aware of. She happened to be sitting next to a friend who knew English very well, so she copied her friend’s answer sheet . She ended up with 48/50. It’s funny, cuz Olga would be one of the last ones to cheat in my class. During our lunch at her place, we were talking about Colombians. They have bad reputation in Ecuador, and I have a tendency to blow off people’s complaints as prejudiced talk. But Marta actually said, “you can’t generalize everybody, but.” That one concession made me listen to them a little more. They were explaining that if you were invited to someone’s house in Colombia, they would have a motive. It wouldn’t just be to be nice and generous. It would be cuz they want something from you. I thought, “hmm. That’s pretty much how things work in the states for the most part. It’s important to ‘return the favor.’ People are seldom nice just because.” They went on to explain that if you need something taken to the states by a visiting Ecuadorian who lives there, he’ll take it even if he has to pay the extra cost. If you need something taken to Spain by a visiting Spainiard, however, they’ll charge you the extra fee. I don’t know. But maybe Ecuadorians are just aware that they’re nicer than most people in the world.